This week, Mesa County Commissioner Scott McInnis wrote an op-ed to share his concerns regarding the Shoshone Water Right. Read his statement and call for action at https://bit.ly/2R7CG31. Commissioner John Justman attended a meeting hosted by Delta County Commissioners regarding the economic impacts from the loss of coal production. 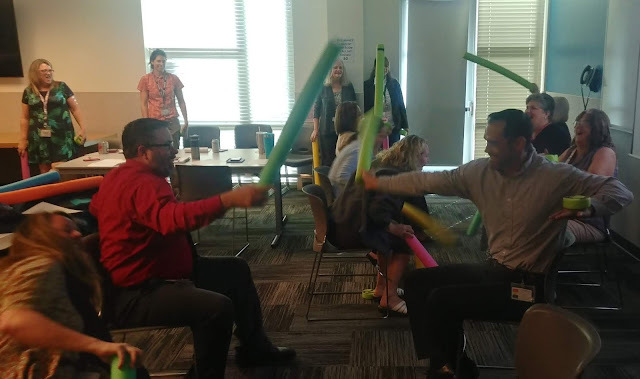 Other attendees included staff from U.S. 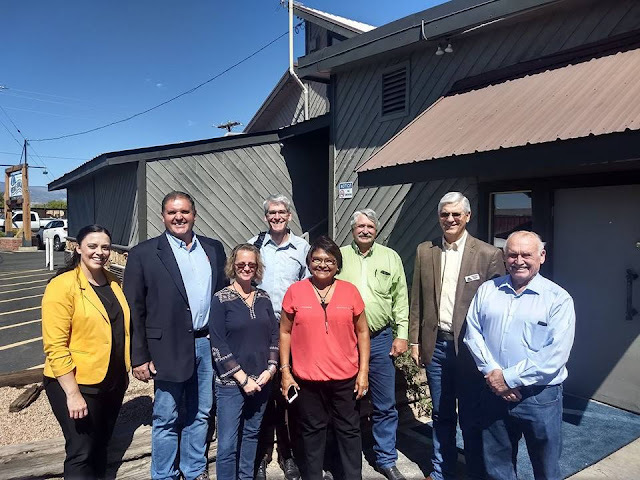 Senator Gardner's office along with officials from the state of Arizona. Dave Norman, left, retires after 44 years with the Area Office on Aging. Norman enjoys a few stories from Adult Services Director Grant Jackson. 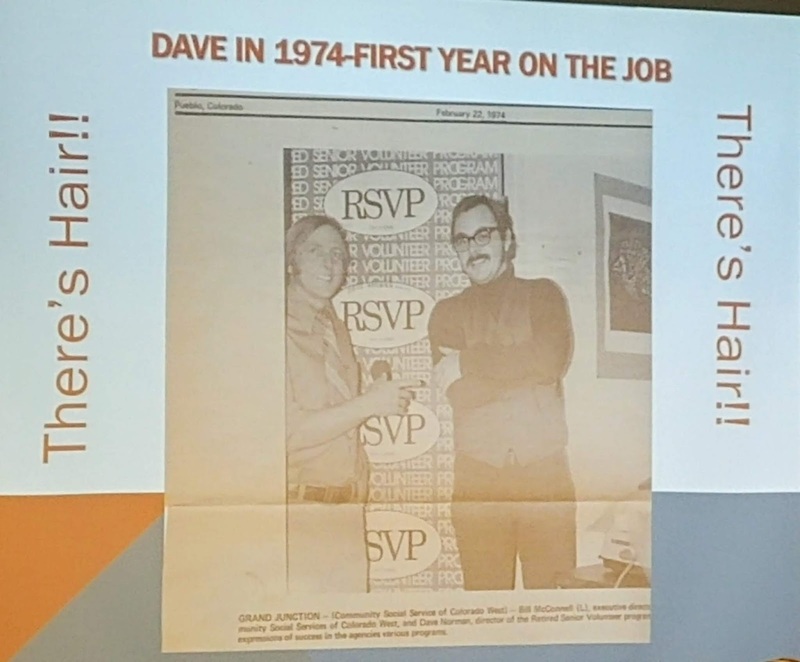 Circa 1974: Dave's first year on the job. 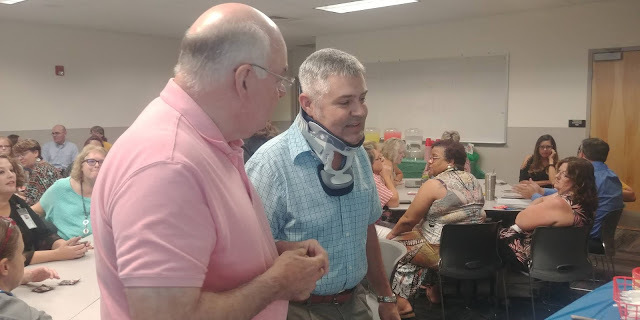 Tracey Garchar, Department of Human Services Executive Director, assures everyone the neck brace is not the result of budget negotiations with Dave over the years. Christie Higgins from ADRC/211 roasted Dave with a few retirement gifts. 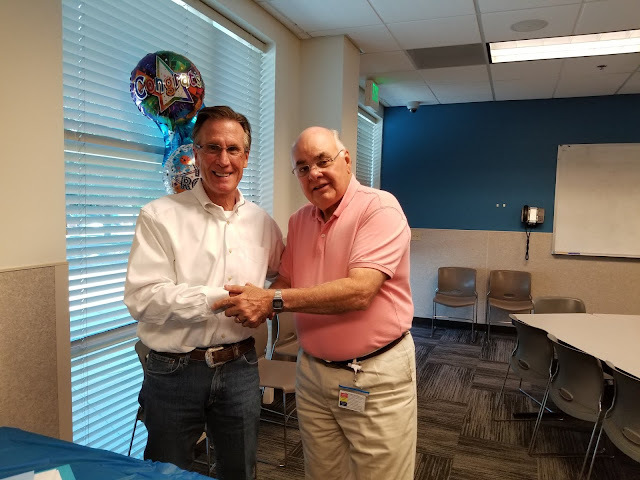 Commissioner Scott McInnis recognizes Dave Norman for his 44 years of service and dedication to the people of Mesa County. 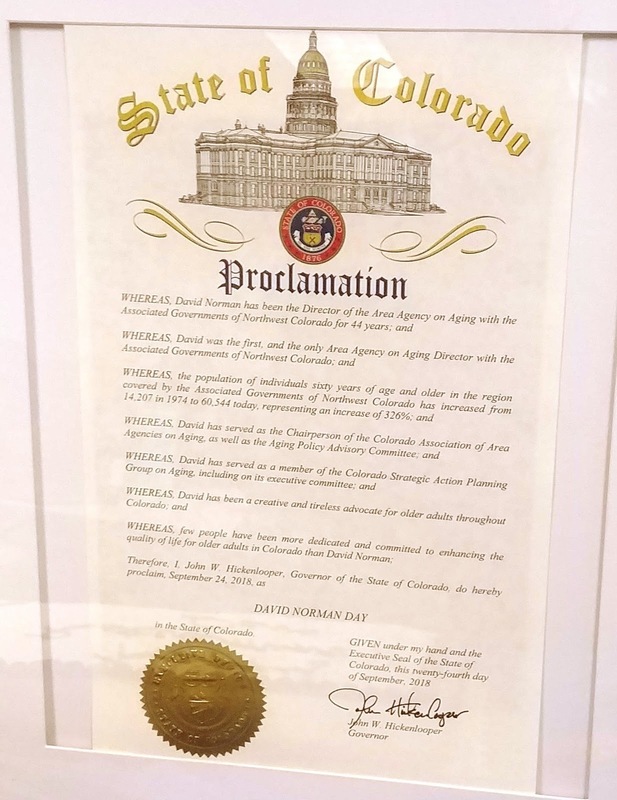 Monday, Sept. 24 was proclaimed Dave Norman Day at the Capitol by Governor John Hickenlooper. He was also presented with the Colorado flag which flew over the Capitol on Dave Norman Day. Joe Kellerby and Curtis Englehart take on a team building challenge with lightsaber-like skills. 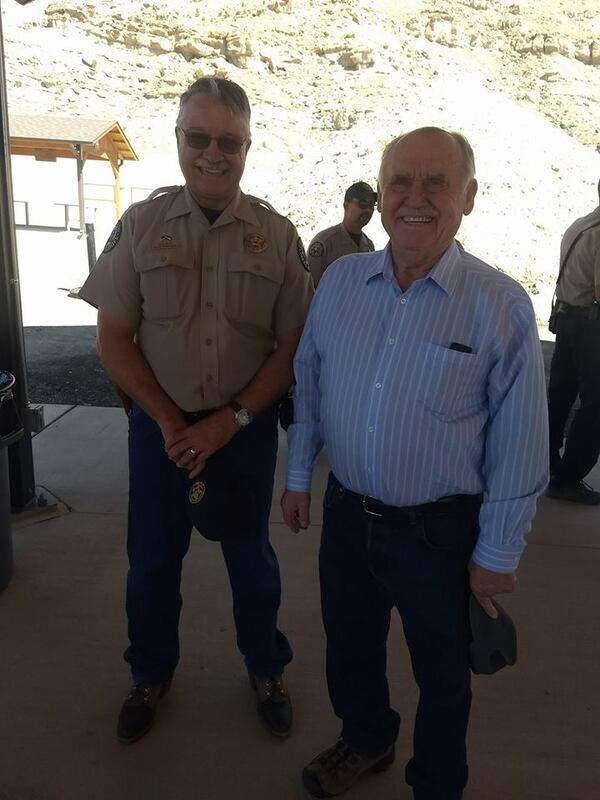 Dean Riggs from Colorado Parks and Wildlife stands alongside Commissioner John Justman at the opening of the Cameo Shooting range. 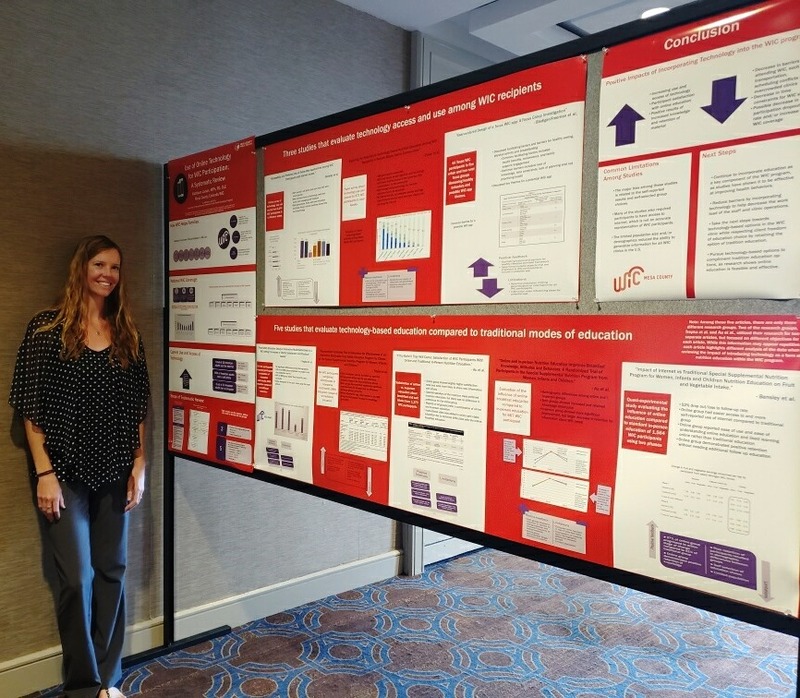 MCPH Registered Dietician Nutritionist Kathleen Larson is at the National Women, Infants, and Children (WIC) Association Nutrition and Breastfeeding Conference in New Orleans, LA presenting her research on nutrition education to her colleagues. Way to go, Kathleen! 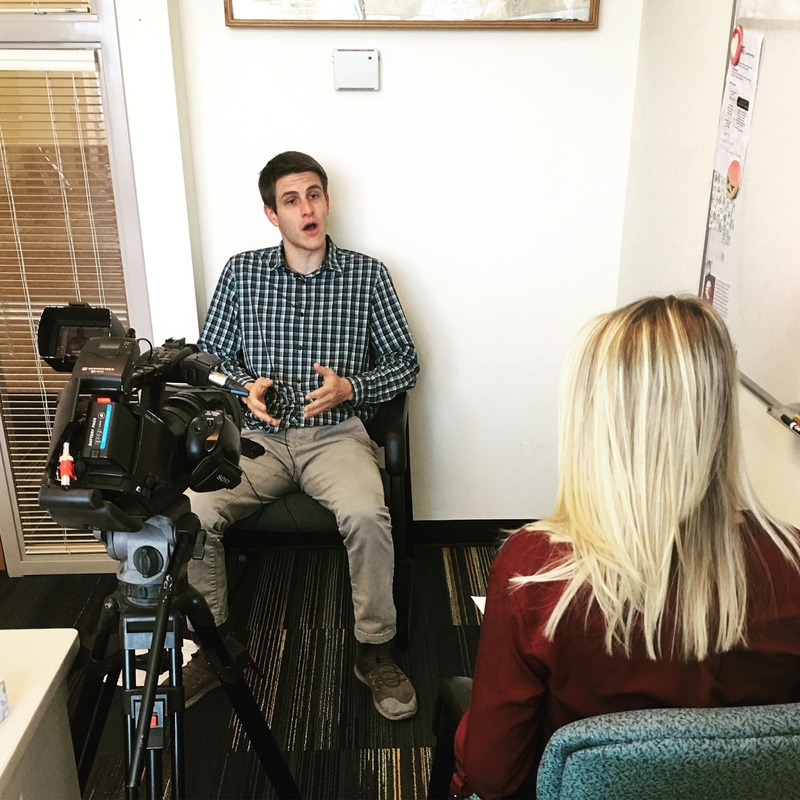 Regional Epidemiologist Andy Tyler interviewed with KKCO about flu prevention, this week. MCPH is hosting flu vaccination clinics in October. Adult Only Clinics: October 17 from 2 to 6 p.m. October 23 from 8 a.m. to noon. All Ages Clinic: October 20 from 9 a.m. to 1 p.m. Public Health takes all major insurances including Medicaid, Medicare and the Children's Health Insurance Plan. They serve all patients regardless of ability to pay, so cost won't be a barrier. MCPH Health Inspector Regina Clark presented to her colleagues at the Colorado Health and Environment conference last week. 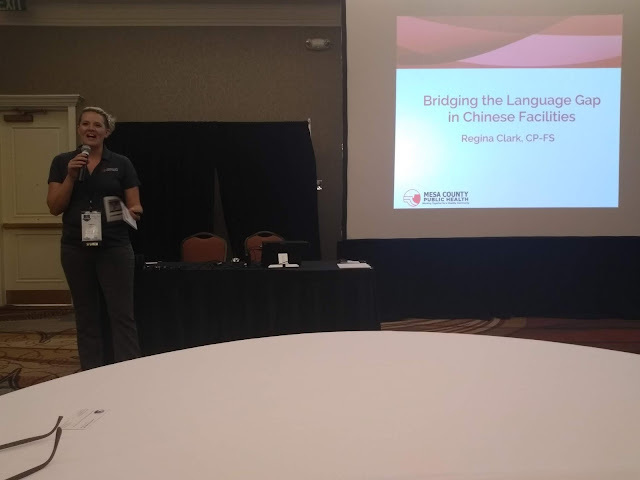 Regina has been working with an interpreter in facilities with Mandarin speaking team members. Directors and managers under Public Works give the commissioners and administrator an update on projects and budget. Public Works personnel brief the commissioners regarding the proposed capital improvement projects for 2019. Mesa County Fairgrounds Event Coordinator Stacy Pinnt makes sure everything is running smoothly for the Grand Valley Kennel Club AKC All-Breed Dog Show at the Mesa County Fairgrounds. 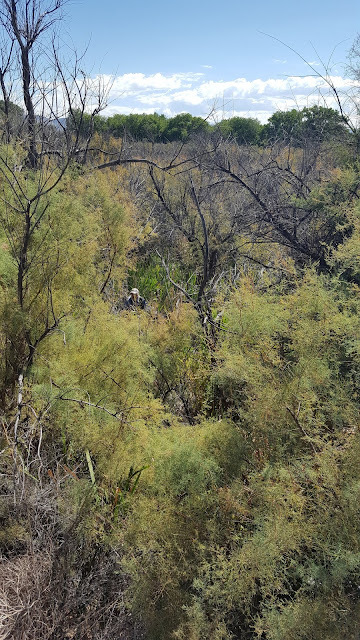 Can you spot the Poodles? They look like piles of cotton or blankets. 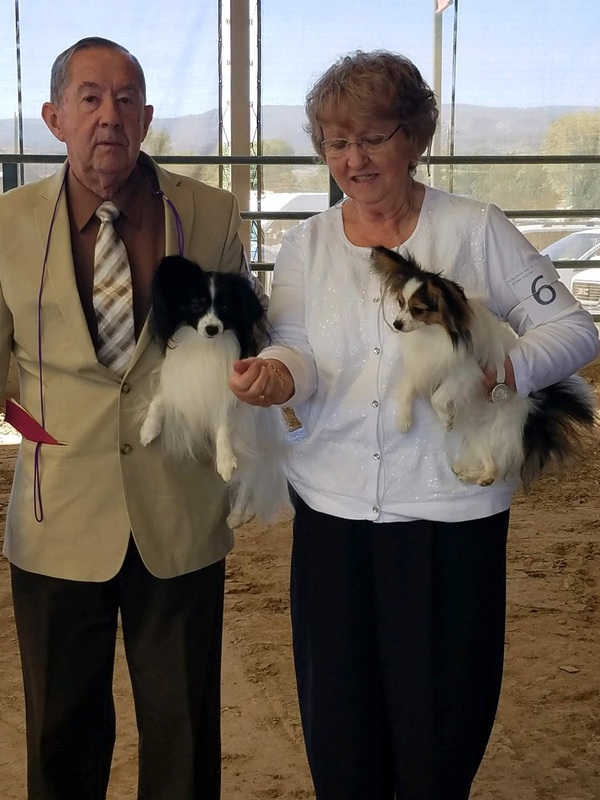 The Annual AKC All-Breed Dog Show is September 27-30. For more information, visit http://grandvalleykennelclub.org/Dog-Show.html. A West Highlands White Terrier poses for the camera. The competition gets underway! The all breed dog show, obedience trials and rally trials are held under American Kennel Club rules and regulations. 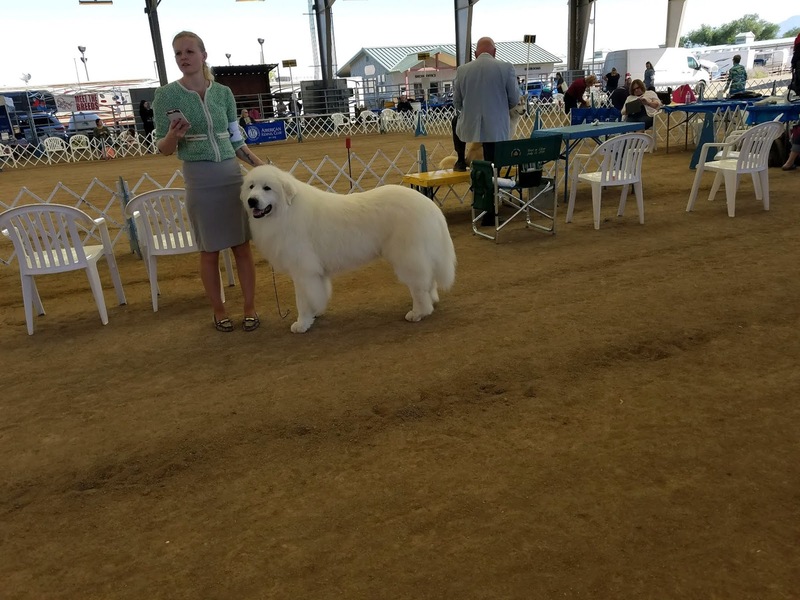 Don't miss out on the AKC All-Breed Dog Show at the Mesa County Fairgrounds. This fun event goes until Sunday, Sept. 30. Two Xoloitzcuintlis, or Xolos for short, get ready for their show Friday morning at the fairgrounds. 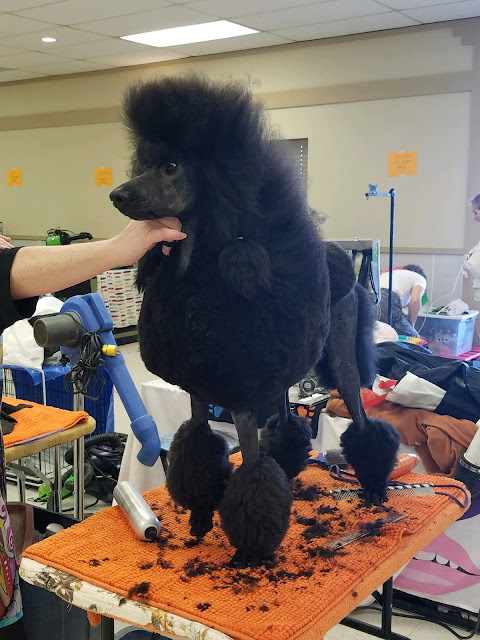 A poodle gets a new do before the show gets started. The Great Pyrenees is ready to perform. A couple with a couple of Papillions practice their routine for the show. 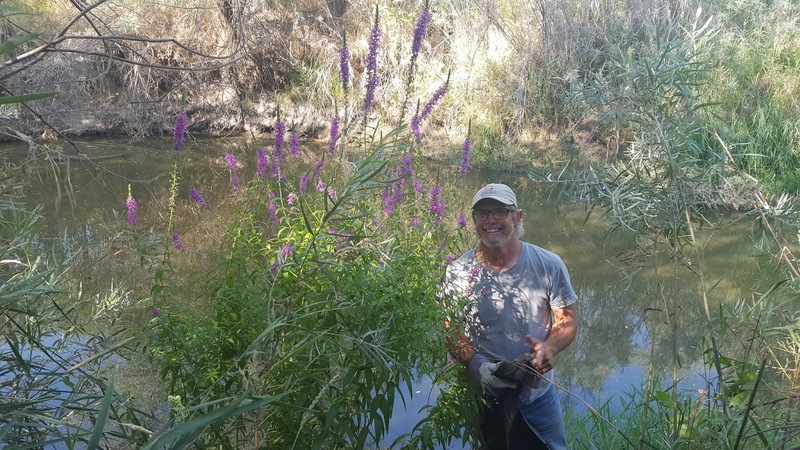 During the last week of work for seasonal employee Willie Wilkins, with Noxious Weed & Pest Management, while treating an infestation of purple loosestrife he finds himself in a jungle of cattails and trees. 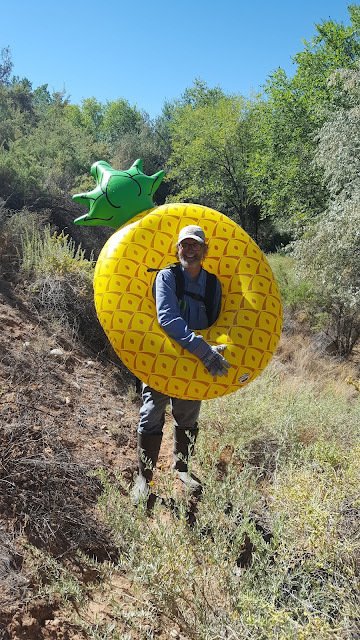 Noxious Weed Management crew member, Willie Wilkins, found himself in a pickle-er-pineapple?! Willie and the crew hauled out some pool toys and lawn furniture that had blown into a drainage ditch after treating the area for purple loosestrife. Willie Wilkins with Noxious Weed & Pest Management bushwhacked his way to find this large purple loosestrife plant near the river. 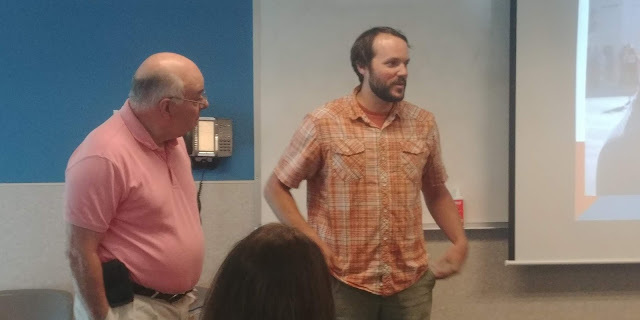 Willie is moving on to a position with CSU Extension and taking his noxious weed knowledge with him. 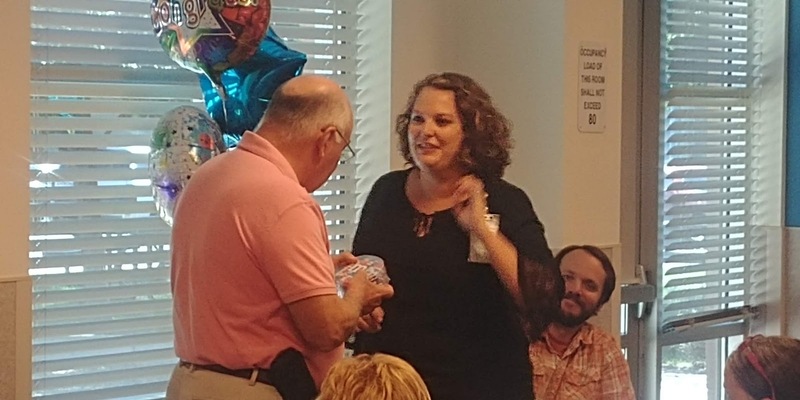 Thank you, Willie, for your hard work this summer! Solid Waste Director, Barret Jensen, helps a motorist at the landfill reattach his trailer to his truck. Residents participate in a waste sort study at the Mesa County Landfill. Mesa County has been leading waste sort studies in Delta, Gunnison, Mesa, and Montrose counties. The study will conclude in 2019. Volunteers will go through this pile of waste to sort its contents for the study. Public Information Officer Stephanie Reecy, second from left, participates in the waste sort study Thursday morning. The purpose of the study is to go through waste to identify and better understand the contents of the waste stream in the region, this allows solid waste management representatives to know what percentages of specific waste that are in the waste stream to help with mitigation, diversion, and recycling. That moment when you find a pot of gold in the trash. Engineers with Souder Miller & Associates, compile data onsite to produce a report for the waste sort study. This regional waste characterization study is funded through the RREO Grant from the Colorado Department of Public Health and Environment. Solid Waste Director Barrett Jensen and Dan and Bonnie Kirkpatrick, owners of Monument Waste Services, sort through waste. From left to right: Deven Pacheco and Timothy Christlieb, with Mesa County Solid Waste, clear the road for vehicles dropping off trash at the landfill after a vehicle dropped hangers in the middle of the road. Clerk and Recorder Sheila Reiner and representatives from the county's Democratic and Republican parties start the Logic and Accuracy (L&A) Test Friday morning. The L&A test is designed to verify that the ballot counting program for the election is properly reading and tabulating votes. Mesa County Clerk and Recorder Sheila Reiner, right, chats with KKCO News Channel 11 Reporter Megan McNeil while the test to verify the integrity of the voting equipment gets underway. Go, Broncos! Sheriff Matt Lewis is a proud Bronco fan and can't wait to show Grand Junction Police Chief Doug Shoemaker, a die-hard Chiefs fan, that the Broncos will win Monday.